1 Blemished Available: $658.79 This item is available as a Blem/Refurb. These are items that cannot be sold as "New" merchandise and are limited to stock on hand. See the product details for a description of the product's condition. 1 Blemished Available: $668.99 This item is available as a Blem/Refurb. These are items that cannot be sold as "New" merchandise and are limited to stock on hand. See the product details for a description of the product's condition. 1 Blemished Available: $668.95 This item is available as a Blem/Refurb. These are items that cannot be sold as "New" merchandise and are limited to stock on hand. See the product details for a description of the product's condition. 1 Blemished Available: $668.69 This item is available as a Blem/Refurb. These are items that cannot be sold as "New" merchandise and are limited to stock on hand. See the product details for a description of the product's condition. Good reviews... I'l know more, after I get it. cause its dank, why else? that's the real question. Because it is the best and it fit me very well. The go to brand with a "new" product, I want to be part of that new experience, and come on, such an agressive look to it! It's gonna match, the aggressiveness of the Dainese D1 jacket of mine! I have the X-12 and love it. Great review of this helmet on Zilla. Race fit helmet that is light, emergency check pads, but most importantly has Bluetooth cutouts. Out have bought an AGV corsa or bell race instead but neither had cutouts. 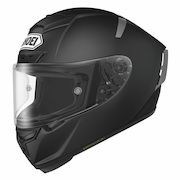 I have a Shoei shaped head and have been wearing Shoei since the RF1100, I like this product and very happy with it. Look at it! Need I say more!? Shoei is a well respected brand with Snell and DOT certs. Clean look at a fair price! Because it's a great helmet. Thanks for all the reviews on the X-14 Revzilla, it really helps when trying to decide on what to buy. Went down in an RF1200. Needed a new helmet, income tax had just come in so figured why not get the best Shoei has to offer this time? Love it so far. Which vents better: X-14, RF-1200, or GT-Air? BEST ANSWER: GT air will generally vent best of these three, but by a relatively small margin. X-14 has outstanding ventilation with 4 dedicated vents and moves a ton of air. Wondering when this helmet will actually be released, and do you guys expect it to be a fairly quiet helmet that's good for Bluetooth capabilities? Or more of a dedicated track helmet? Not really a quiet helmet. This helmet is called Shoei X-Spirit III in Europe. Is it the EXACT same helmet, or are there any diffences apart from the name? "The differences are in shell construction as well as the EPS liner density to meet the testing requirements." So there you have it, its not really the same helmet. I ASSUME the changes were made to pass the SNELL standard. There is great controversy over whether SNELL is safer or less safe standard than ECE, but you can research that for yourself. In the end, if you are looking for the same helmet that got the great SHARP rating, the X-14 isn't it. Could it perform just as well as the X-Spirit III in the SHARP test? Maybe, but as SHARP only tests European Helmets, we will probably never know. What is the internal sizing of the helmet like, is it round oval or long oval? BEST ANSWER: According to Lid Picker dot com's free data page the x-14 is more on the round side and just slightly on the small side. I would call it an intermeditate oval but with a slightly rounder cut. I found that it runs true to size. It will feel tight when you try it on, but it breaks in quickly. Due to that, you may feel that you need a "size up", but I would not recommend it, as it will break in fast. Will be a quit helmet ? BEST ANSWER: With the chin skirt and spoiler installed this is very quiet. Without either installed I would say it's moderately quiet but very liveable. I do not find it to be very quiet, but the noise does tend to be isolated in the lower part of the helmet. I ride an fz 07, with that riding position has anyone here ridden anything like that and found this helmets field of vision/fit/comfort better than say an rf 1200 or is this the better option? My riding style is more sport touring occasional track day rider with my rides lasting on average between 1-4 hours. BEST ANSWER: I have an FZ-09 and had the x14 for ~3 months now. It's very comfortable to wear for touring. I also did a track day with it, it was pure money on the track. My worry was the lean angle this helmet made for (tuck vs touring); and it is and issue, but a very small issue. When I'm fully upright I can notice the airflow isn't as good as if I lean forward just a tad. I replaced my handlebars so I have a slightly more aggressive lean and this helmet works just fine. Does the sena 10u fit properly into this helmet? BEST ANSWER: No, it does not. That is, the 10U for the GT Air does not. However, if you already own a 10U for the GT Air you can make it fit with some ingenuity. I did. Measured head size is exactly between the max size of the SM and the Min size of the MD. Would you suggest ordering the SM for a snug fit? BEST ANSWER: I would go with the medium. This helmet fits a little more snug than most helmets. I ordered a medium because I had tried on a few Shoei helmets prior to the purchase. Once I tried on my X-14 I realized it was very snug almost uncomfortable. Its been 2 months and its still a tight fit. Snug fit is always safest when it comes to helmets. Does the Shoei pinlock ready photochromic shield fit this helmet? The cwr-1 shield? BEST ANSWER: Yes, the CWR labeled visors will fit this helmet. The Vents on top and the Blades on the back, are they a Grey Plastic or Lightweight Aluminum (Or other metal)? BEST ANSWER: Rear flaps are plastic. They can be removed or customized with narrower flaps depending on preference or track demands. I don't know the answer to your question. I have a white Shoei X-14. It is a great helmet. They are plastic (most likely to keep weight down), but still very high quality.